Every successful look starts with underwear that is comfortable and optimally shaped to your body. At G-Star RAW we understand the importance of quality men’s underwear. In our collection you’ll find boxer briefs and sport trunks made of the finest materials. After picking the right underwear you can choose your favorite pair of jeans a nice shirt and the coat that suits your style. Every boxer features soft jersey fabrics that will last for years to come. A supportive elastic band with distinctive branding provides an extra comfortable fit. Reinforced stitching at the most important points prevents wear and tear and makes sure that you can enjoy your new pair of boxers for a long time. Don’t underestimate the importance of the right underwear! Our underwear for men will help you feel confident throughout the day. Our boxer briefs flawlessly follow the shape of your body and form the perfect base for the rest of your attire. You can choose from a variety of colors and patterns as our men’s underwear is made to match every look and every style. 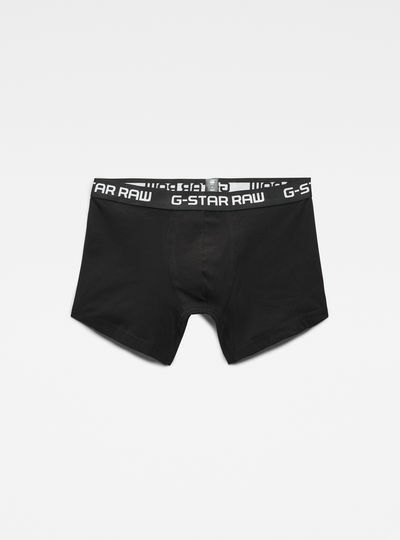 Ordering a quality pair underwear for men was never as easy as in the G-Star RAW online store. Collect your favorite pairs of boxer briefs in your online shopping cart and once you’ve found all the items you were looking for proceed to the checkout. Choose your preferred payment method and complete the purchase. Your men’s underwear will leave the G-Star warehouse the same day (Mon-Fri) and will be shipped to your home within days.